Let the battle begin! Play with or against others. Connect wirelessly to other cubes. Already bored by winning Gomoku against the CUBE? Search for a human opponent! Disappointed by losing Gomoku against the CUBE? Search for a human opponent! SDK Available. Write your own games, applications and light shows! Make a fantastic gift with your voice, favorite music and perhaps with a message to the person you love. Programming Rubik’s Futuro Cube is easy, look at the many examples and start by modifying them. Free your mind. Enjoy the motion, release the stress and relax. You are not in a virtual reality, Rubik’s Futuro Cube is real and you are being hypnotized! You eyes are heavy. You are falling asleep... you will wake up when I count to 10 and you will go to buy a CUBE!! 1..2..3......10! Sounds, voice, light, vibration. All inclusive in one small package. The MyCube application makes your CUBE unique, stylish and personalized. You can run script automatically when the USB is disconnected. Create puzzle code lock! Train your hands! Improve your fine motor skills, gain precision and concentration. You will find out that less means many times more. Always aim for the center of sides! Do not toss the CUBE against wall, this pattern is INVALID and PROHIBITED! Twisty puzzles. Challenge your mind with unique tasks. Spend minutes, hours or days finding solutions. Gravity Puzzle is one the most challenging and most beautiful puzzles on the Rubik’s Futuro Cube. Ring Dream is an easier version, anyone can solve. At least that’s what’s written in the description! Challenge your friends. Compare high scores and show off your dexterity. Play with the CUBE in public transport! Count how many heads turn. Show the CUBE to your dentist! For no particular reason! Do you want to sell Rubik’s Futuro Cube in your shop? Do you love the classic games like Tetris, Snake or Gomoku? Do you like spatial brain-teasers, multiplayer challenges and smart gadgets? You can have it all in a box! Rubik’s Futuro Cube is simple yet ultimate gadget of the 21st century. It’s The One Gaming Gadget you need. FUTURO CUBE becomes RUBIK‘S FUTURO CUBE. Read more in history or product details. You can create your games or applications. You can create unique gift with hidden messages. You can use “MyCube” script to personalize your CUBE. Rubik’s Futuro Cube senses rotation, determines tapping on any side and sees which side is facing towards ground. 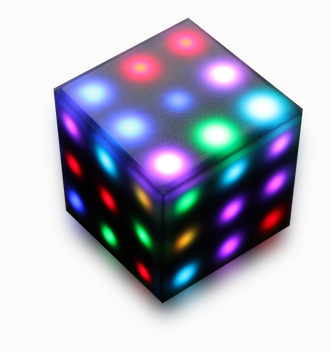 It can vibrate, play audio and dynamically change it’s LED colors across any face of the cube to provide feedback. Many games take advantage from these control and cubic surface of the playground. Cube has built-in radio transceiver, connect two cubes on short distance and challenge your friends. Rubik’s Futuro Cube senses actual changes of its position. For control is therefore essential to learn how to tap the sides of the cube. Taping creates little movements that are recorded and evaluated after. Not only each tap to each side is detected, but as well differences between side tap, top tap and bottom tap. Even it sounds that the cube must move a lot, by practice you can tap the cube very gently and yet it is hundred percent recognized. Rubik’s Futuro Cube senses simple gestures based on different kind of rotation pattern. One of them has been chosen for GAME MENU gesture. Motion pattern, that is hardly done by accident in your pocket or bag and also motion, that in same time needs little practice to perform correctly, so even nerve-wracking games are not interrupted by unintended gesture recognition. 54 RGB diodes with 64 or 256 steps of brightness for each color component, that means 9 three-colored spots at each side providing count less possibilities for games and displays. Refresh rate is so fast, you can not see it blinks! Why not to try play some interesting games with two cubes at the same time. Like you would have two chess boards or Tetris planes connected together. 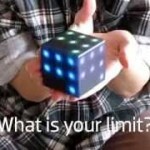 Cubes can communicate with short distance using radio link and you can challenge your friends in a complete new manner. Are you more than two? No problem, once you establish connection, no one else can interrupt you!